There are a number of ways to keep your hands warm on the road. Thick warm gloves may be the answer along with thin inner gloves. Perhaps mittens on your handlebars to shield you from the biting wind may also provide the solution. However, there’s many ‘trade-offs’ with gloves and mittens which may boil down to cold prevention versus dexterity. A glove still has to protect against impact and injury and allow the operation of controls but cold hands also increase the risk of incident. An effective method of keeping the cold at bay is electrically heated gloves. The Gerbing 12V XRS-12 Short Gloves offer both warmth and protection at an affordable price. If you cover serious miles you’ll want to invest in something more substantial like the iXS X-7 Lithium-Ion Heated Gloves. A good pair of heated gloves should keep the vulnerable areas of your hands warm when riding in the cold. These are the places most exposed to the elements such as the fingers and the back of your hands although a quality glove will heat the palms too. Heated gloves may cost three times the prices of a non-heated glove on a like for like basis. For example, a thick pair of winter riding gloves may stretch to over £100. Its heated counterpart may well retail at nearer £300. Like any new piece of kit it’s important to familiarize yourself with their use and handling. Not everyone likes to have wires running about their gloves and handlebars but with practice and good routing they won’t pose a problem. While the benefits of heated motorcycle gloves are obvious let’s not forget that gloves are also to protect and shield against injuries. 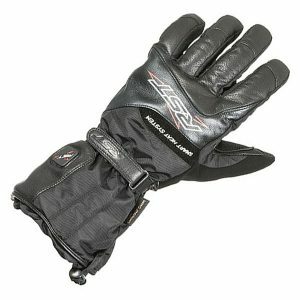 Make sure your heated gloves have the same protective qualities you’d expect from any other motorcycle glove. Alternatively you can buy a thin heated glove designed to be worn underneath a normal glove but make an allowance in size for the extra pair. Most heated glove models have a temperature control button or switch. Best to ‘power up’ than ‘power down’. Start your journey with the lowest setting because it’s easier to increase temperature than lower it quickly. The highest settings on some models are seriously hot. Perhaps you don’t need to turn on the unit at all but keep an eye on excessive heat as these items are capable of burning your hands if not operated correctly. 1. Small pre-charged batteries can be inserted into your gloves and connected to the heating system although long distance riders may find that 3-5 hours may not always be sufficient. 2. Plug your wiring into the motorcycle battery via extension cables running through the jacket. The cables routed through your jacket and into your gloves needn’t be as cumbersome as some riders report. As long as the cables are secured and long enough to avoid any restriction of rider movement then with a bit of basic familiarization you shouldn’t even notice them. This video shows how to install the wiring directly to your motorbike battery. The two main charging voltages are 7 volt and 12 volt. The latter is usually achieved by connecting your gloves to your bike’s battery. This is more reliable and gives you a longer heated journey. 7v batteries at full temperature setting will drain a battery quicker and in the extreme cold are unlikely to match a fully connected 12 v charge. These expensive accessories shouldn’t be taken for granted. A little consideration for their care and operation will extent their working life and avoid you being caught short on a cold day. For example, when you finish your journey make sure you’ve turned the batteries off in your gloves or put them on charge again. Leaving them on all day while sat in a drawer or locker will drain them. In the summer when they’re not in use, make sure they get the occasional charge to retain their capacity to power and hold that charge. 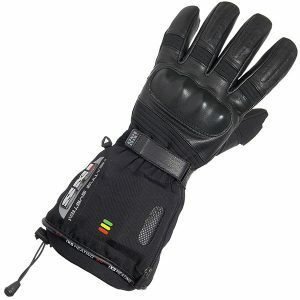 The Gerbing G-12 heated gloves are described as short gloves but the generous sleeves pass comfortably over the wrists. Protection comes not from knuckle-mounted studs or excessive padding but from the leather itself. Raised palm pads do provide additional protection in these vulnerable areas. 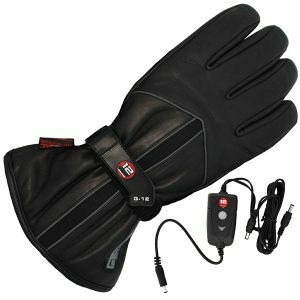 The G-12 is a lightweight heated glove with a battery cable and junior controller included. The system heats the entire length of each finger and there’s a lifetime warranty on the heating elements. No surprise that the liner is both waterproof and windproof. If knuckle armour and finger pads is what you’re really after then the Gerbing short cuff length heated gloves have buckets of them. It includes many of the features of the Gerbing G12 such as heated fingers and Thinsulate thermal liner. 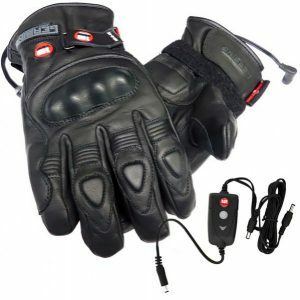 You can connect these heated gloves the directly to your bike with Gerbing’s battery hook-up. The XRS-12 gloves are made with soft and supple drum-dyed 0.6 mm premium full aniline leather that contours to the hand with stainless steel Microwire heating. The RST Thermotech Heated Waterproof glove uses premium grade cowhide, super fabric and neoprene along with heavy-duty bonded nylon thread. Each glove is fitted with a 7.4V lithium battery to produce 3 levels of heat – low, medium and high. Battery life on the top setting is two and a half hours and on the lower temperature setting you’ll get more than three. This warming layer runs over the top of the hand and fingers where you’ll most need the warmth in icy and bitter conditions. The elasticated Powergrip wrist closure provides a secure fit and the ergonomic pre-curved finger design helps prevent fatigue. Palm protection is enhanced with double leather padding. This stylish full-length glove is made of goatskin leather and polyamide textile. It has a Hipora waterproof and breathable membrane and a Thinsulate thermal quilted lining. Protection is provided with shock absorbing knuckle armour, added finger padding and leather palm reinforced with suede. Slightly more expensive than other models. 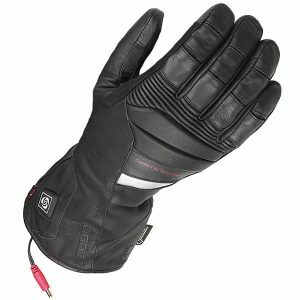 The heated Dane Fyre glove with a Gore-Tex membrane makes it suitable for very cold weather riding. It is constructed from supple goat aniline leather and offers additional comfort through large stretch sections and finger pleats. It is fully waterproof and windproof combining optimised breathability and protection and comfort. The Dane Fyre uses a Z-liner Gore-Tex construction. The Gore-Tex membrane is bonded to a lightweight fabric and is then freely suspended between the outer fabric and the lining. Remember that any piece of new riding gear you buy is a potential source of risk. To eliminate that risk try it on, make sure it fits and practice using it until operation becomes a simple and effective reflex.